A few posts back I mentioned that I was holding a Goodreads book giveaway for A Housefly in Autumn. That giveaway has come and gone. Here is what I learned. Submit your giveaway at least a week before you want it to begin. It’s supposed to take Goodreads a couple of days to approve your giveaway. Mine took about a week. I had scheduled my giveaway to begin the day after I submitted it and run for a month. Consequently, I lost about six days off the front of it. I wouldn’t have minded so much losing six days in the middle, but what I didn’t know is the first few days and the last few days of a giveaway are the most important. There are tons of giveaways on Goodreads. Most folks who are interested in them look in two places: the list of new giveaways and the list of giveaways about to end. When my giveaway was finally approved, it was already six days old. My listing, when it showed up, was already deeply buried with in the new list. Only giveaway hunters with great perseverance would dig that deep. I missed out a good number of entries because of this. According to the site, the average giveaway garners 825 entries. When you miss the first week or your own giveaway, you get fewer. The middle of a month-long giveaway is the doldrums. The book is prominent on neither of the lists people search. Hence, the number of entrants drops sharply. Only after I had set up my giveaway did I find good advice about ignoring the Goodreads recommendation for longer giveaways. A long middle does no good. It’s best to jump directly from the new list to the about to end list. A week seems plenty long for a giveaway. I offered autographed copies. This was another mistake. Autographed copies meant I would have to mail them myself, which led me to yet another mistake. I limited my giveaway to the U.S. because I didn’t want to have to pay huge amounts to ship books overseas. If I had not offered autographs, I could have bought the books online and had them shipped directly. Who knows how many entrants I cut myself off from by limiting the giveaway like this? There are two main goals in offering a giveaway. The first is to get members to add the book the their “to-read” lists. The mistakes already mentioned hindered my efforts in this direction. As it was, 525 people entered, of which 228 added the book to their personal lists. Many of those people have more than 1,000 books on their “to-read” lists; some have tens of thousands. This means there are thousands of books on lists that will never be read. The second goal of a giveaway is to garner reviews. 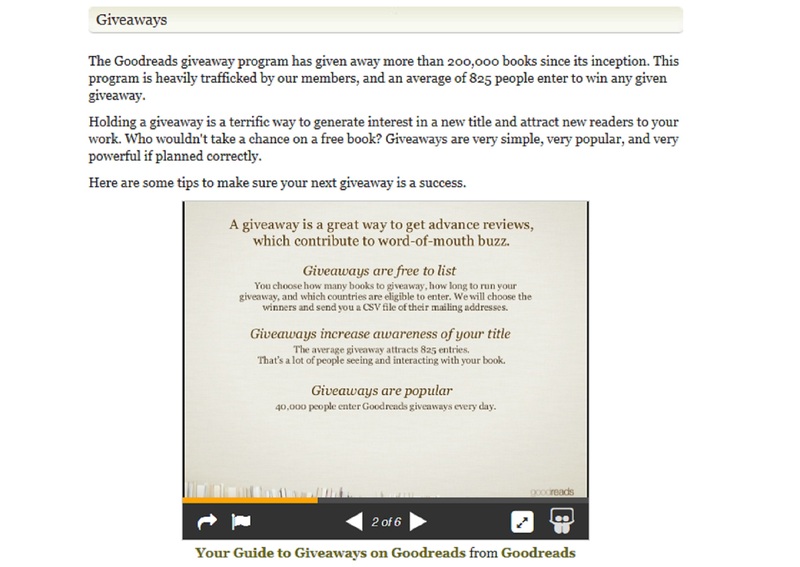 Goodreads say that around 60% of people who win giveaway books write a review. Most commentary I’ve read suggests this is overly optimistic. I gave away six books. By Goodreads numbers, I should receive at least three reviews. I would love for this to happen, but one thing I’ve learned in this self-publishing biz is not to hold my breath.